On the campaign trail, Mitt Romney has been hammering a statistic that “over 92 percent of the jobs lost under this president were lost by women,” evidence, he says, that President Obama’s policies amount to a “war on women.” Romney’s statistic is accurate, as far as it goes. But it’s not the whole story. Looking back at the whole recession, men have lost many more jobs than women. But the biggest job losses for men came earlier in the recession, and recovery for men has come faster than it has for women. With Romney under attack from the Obama campaign for policies it says are anti-woman (such as Romney’s opposition to abortion rights and support for federal de-funding of Planned Parenthood), Romney has tried to turn the tables, pointing to a statistic that shows the unemployment rate for women is recovering more slowly from the recession. Romney, April 11: He [Obama] has lost 800,000 jobs during his presidency. And by the way, do you know what percentage of those jobs lost were lost by women? Over 92 percent of the jobs lost under this president were lost by women. His policies have been, really, a war on women. Romney’s statistic is accurate. It’s true, according to data from the Bureau of Labor Statistics, that between January 2009, when Obama took office, and March 2012, there has been a net decline of 740,000 jobs for both men and women, and that among women there has been a net loss of 683,000 jobs. The Romney campaign did the math and calculated that 92.3 percent of the jobs lost under Obama were lost by women. But is that a result of Obama’s policies, as Romney says? A look at this chart — which we created based on official Bureau of Labor Statistics monthly figures for seasonally adjusted nonfarm employment (the standard measure for jobs) — tells another story. What the graph shows clearly, and the numbers back up, is that men took a bigger hit than women, and the decline in jobs for men began much earlier. The downturn in male employment began in May 2007 — a full seven months before the official start (in December 2007) of what became the worst economic recession since the Great Depression. Female employment continued to rise for 10 months after the downturn in male employment, and it peaked in March 2008. By the time Obama took office in January 2009, both male and female employment were in a steep decline that continued for over a year. Male employment hit bottom in February 2010, and female employment continued to slump for another seven months, bottoming out in September 2010. 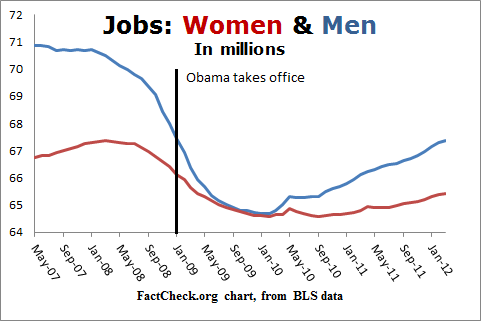 And as the chart clearly shows, the job recovery for women not only started later, the rate of recovery has been slower. Why is that? “If you look back to the start of the recession, many of the industries (construction and manufacturing) that were very hard hit initially were male-dominated,” said Margot Dorfman, CEO of the U.S. Women’s Chamber of Commerce, in an interview with FactCheck.org. It wasn’t until later that jobs like retail and government jobs, particularly teaching jobs, began to take a hit, affecting women more, Dorfman said. Those jobs have been slower to recover. Diana Furchtgott-Roth, a chief economist at the U.S. Department of Labor under George W. Bush, says Romney’s statistic isn’t properly focused. She notes that the unemployment rate for women has been about one full percentage point below the unemployment rate for men for much of the recession. It is only fairly recently that the gender gap has begun to close. The unemployment rate is now 8.3 percent for men, 8.1 percent for women. “That’s why many people have called this a man-cession,” said Furchtgott-Roth, a senior fellow at the Manhattan Institute. Men have fared worse in the recession, she said, mainly because industries such as construction and manufacturing – male-dominated industries – have been harder hit than education and health care – female-dominated sectors. Furchtgott-Roth said she couldn’t think of any Obama policies that have led to a slower recovery for women. For example, she said, his policies have hurt coal mining and oil drilling, which are typically male-dominated jobs, whereas the health care law will expand the health care industry, which should disproportionately help women. “There’s an argument that some of the recent job losses have been from state and local governments,” said Dan Mitchell, an expert on fiscal policy issues at the libertarian Cato Institute. He said “women are disproportionately affected” now that federal stimulus funds no longer support state and local payrolls. Betsey Stevenson, a former chief economist for the Department of Labor under Obama, said that while men have fared somewhat better than women in the private sector, most of the phenomenon cited by Romney can be tied to a loss of government jobs. About 78 percent of the decline in people on payrolls has been a decline in government employment, said Stevenson, now an assistant professor of business and public policy at the Wharton School of Business at the University of Pennsylvania. And, she said, women have absorbed 76 percent of the net decline in government jobs. Saul, April 12: While women were losing their jobs by the hundreds of thousands, President Obama chose to focus on an agenda of more taxes, more regulations, and more expensive energy that only made our economy weaker. When Obamacare discourages employers from hiring and raises taxes on innovative medical companies, women are hurt. When Dodd-Frank prevents banks from making loans to small businesses, women are hurt. When EPA regulations drive up electricity prices and the Department of Interior prevents oil drilling, women are hurt. Of course, all Americans want a strong, prosperous economy and opportunity for themselves and their families, and men have been hurt by the President’s agenda as well. The reality is, on the issues that matter to the American people, President Obama has been a total failure. We’ll let readers judge the extent to which Obama’s tax policy, energy policy, financial services regulation and health care legislation have affected the economic recovery. In none of that, however, could we discern an explanation for why women would be affected more than men.